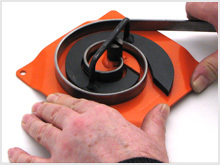 The Mk 2/2H Scrolling Tool is a bigger version of our entry level MC017 Mk 1/2 scroll bender. It produces bigger scrolls up to 127mm across and can work with all sizes of steel up to 20mm x 3mm. Again this works as a hand drawn scroll bender jig, where the end of the steel bar is gripped in the centre and pulled round the inner segment by hand. Larger scrolls are made by dropping in place the larger outer segment. 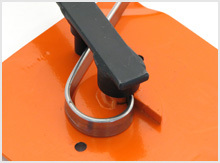 The tool is also supplied with a special starting lever as and aid to help form the initial part of a scroll when using using bigger steel sizes. It produces flat and consistent wrought iron effect scrolls. Grip steel in centre of scroll former and by hand, pull it around the inner fixed segment to make a smaller scroll. For larger sizes of steel, you may find the Starting Lever supplied, helpful in providing the extra effort required to ensure a nice tight inital bend to the scroll. Drop-in outer segment to make a larger scroll.